TERRIFIED airline passengers could only watch as an engine started to tear apart mid-flight between Las Vegas and Florida. Passengers, fearing for their lives, started calling loved ones to say goodbye. The flight crew immediately requested a return to Las Vegas McCarran International Airport and were allowed to do so at 7:27 am, some 15 minutes after takeoff. Every one of the 166 passengers and the six crew members were safe. 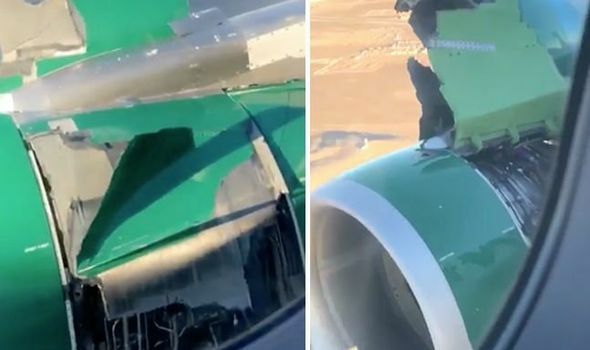 A spokesman added: “During takeoff on Frontier flight 260 from Las Vegas to Tampa today, a section of an engine cover came loose and separated from the aircraft. “Pilots immediately returned to airport. One passenger said the airline offered everyone a free breakfast voucher, a full refund and a $500 voucher for a future flight. It follows a VietJet Aviation JSC flight that made a troubled landing on Thursday evening after the wheels on its front landing gear had “problems”, with passengers reporting minor injuries, the carrier and Vietnam’s aviation authority said on Friday.